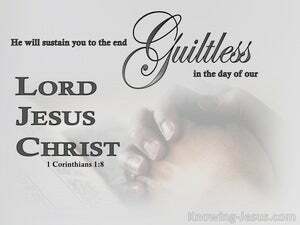 ﻿ 1 Corinthians 1:8 Who shall also confirm you unto the end, that ye may be blameless in the day of our Lord Jesus Christ. He will also confirm you to the end, blameless in the day of our Lord Jesus Christ. He will keep you strong until the end, so that you will be blameless on the Day of our Lord Jesus the Messiah. who will also confirm you until the end, irreproachable in the day of our Lord Jesus Christ. who shall also confirm you unto the end, that ye be unreproveable in the day of our Lord Jesus Christ. 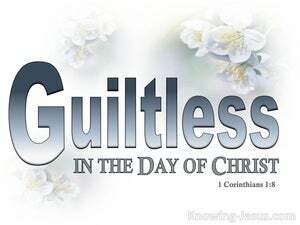 And He will establish you to the end [keep you steadfast, give you strength, and guarantee your vindication; He will be your warrant against all accusation or indictment so that you will be] guiltless and irreproachable in the day of our Lord Jesus Christ (the Messiah). He will also make you stand firm [in the faith] to the end [of your lives], so that you will be [considered] without just blame on the day when our Lord Jesus Christ [returns]. He also will establish you even to the end, and make you blameless in the day of our Lord Jesus Christ. 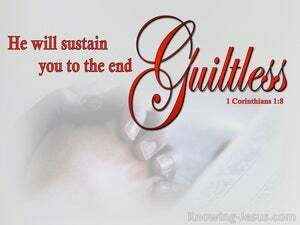 Who will give you strength to the end, to be free from all sin in the day of our Lord Jesus Christ. and God will confirm you to the end, that ye may be unaccused in the day of our Lord Jesus Christ. who will also establish you unblamable unto the end in the day of our Lord Jesus Christ. and at the Day of our Lord Jesus Christ he will insure your complete vindication. waiting for the revelation of our Lord Jesus Christ, Who will also confirm you to the end, that ye may be blameless in the day of the Lord Jesus Christ. who shall also confirm that ye shall remain unimpeachable unto the end, in the day of our Lord Jesus Christ. Who also shall make you firm even to the end, blameless in the day of our Lord Jesus Christ. Who shall also confirm you unto the end, that you may be blameless in the day of our Lord Jesus Christ. He shall also confirm you to the end, that you may be blameless in the day of our Lord Jesus Christ. which shall strengthen you unto the end, that ye may be blameless in the day of our Lord Jesus Christ. and to the very end he will guarantee that you are vindicated on the day of our Lord Jesus Christ. He will also keep you perfectly stedfast unto the end, so that you will be unreproveable in the Day of our Lord Jesus Christ. 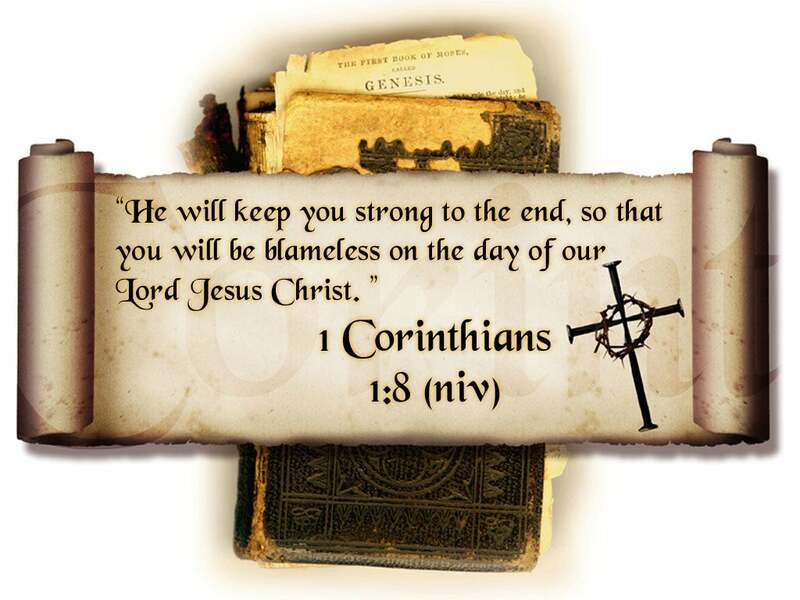 He will also strengthen you to the end, so that you will be blameless on the day of our Lord Jesus Christ. who will also make you steadfast to the end, so that ye may be without blame in the day of our Lord Jesus Christ. who also will confirm you to the end, without blame, in the day of our Lord Jesus Christ. who shall confirm you to the end blameless in the day of our Lord Jesus Christ. And God himself will strengthen you to the end, so that at the Day of our Lord Jesus Christ you may be found blameless. Who will also confirm you to the end, that ye may be blameless in the day of our Lord Jesus Christ. who will also keep you stedfast to the very End, so that you will be free from reproach on the day of our Lord Jesus Christ. and to the very end He will guarantee that you are vindicated at the day of our Lord Jesus Christ. Who will also confirm you unto the end, unaccusable in the day of our Lord Jesus Christ. 7 So that ye come behind in no gift; waiting for the coming of our Lord Jesus Christ: 8 Who shall also confirm you unto the end, that ye may be blameless in the day of our Lord Jesus Christ. 9 God is faithful, by whom ye were called unto the fellowship of his Son Jesus Christ our Lord.